When my youngest daughter got married, to save money we decided to do a lot of the work ourselves. We had planned and shopped and put together all of the invitations, bouquets, boutonnieres, corsages, centerpieces, decorations, wedding favors, attendant gifts, the hair and makeup for all of the bridesmaids, the cake, etc. It was a lot of fun but also a lot of work and sometimes it was a little stressful. The food and dresses were done by professionals and we had planned to have a professional photographer as well. 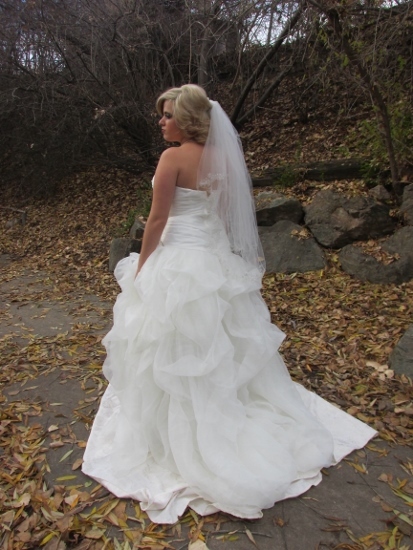 Tarrin had set an appointment with the bridal photographer on a Saturday, a couple of weeks before the wedding. There would be just enough time to get the photos printed and find the perfect frames for them. A day or two before the appointment the photographer called and said she had a family emergency and would need to reschedule. They set a new appointment for Saturday of the following week. It would be cutting it close to have the photos ready to display by the wedding day, but what else could be done when faced with a family emergency? We’d have to make it work! Tara called her friend who was planning to do her hair and makeup for her, and let her know about the new date and time. She said she’d be there. On Thursday before the appointment Tarrin sent a message to the photographer asking to make sure she was going to be able to make the appointment this time. She waited for a reply. There was no reply. For the next two days she messaged, called, emailed, text and posted on social media trying to get ahold of the photographer. For the next two days we waited somewhat frantically and very impatiently for a reply. There was no reply. Then came the frantic brainstorming of where we could find a new photographer at this late date! Then came tears from the bride-to-be, heartbroken that her plans for the perfect wedding were going to be ruined. Grasping at straws we commented that maybe the photographer would show up or call at the last minute, but we knew that was unlikely. I told my daughter that as a last resort, I could take her pictures. Thankfully we were able to book my niece’s ex-husband (at her suggestion) to take the photographs on the wedding day but he was unavailable for the bridal photos. Finally we decided we didn’t have much choice and that she would go ahead and get ready and if we didn’t hear from the photographer she would reluctantly allow me to fill in as her Bridal Photographer. On Saturday, Tara’s friend showed up and did her hair and makeup she put on her gorgeous dress and she looked stunningly beautiful! Then we waited, holding onto a tiny smidgen of hope that the photographer would show up. Of course, she did not. So Tarrin and I resolutely gathered the camera and all her things and got into the car and drove to the park to take pictures. It was late fall and the snow had graciously held off falling. The park has a secluded spot with a bridge over a creek. It was full of colorful fall leaves and the creek was babbling softly. 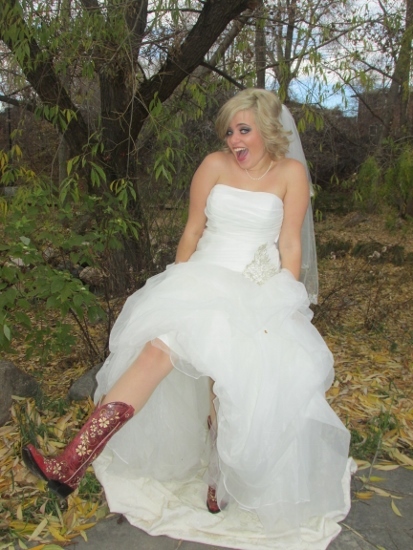 Her wedding had a country theme so it presented the opportunity to take some fun shots. 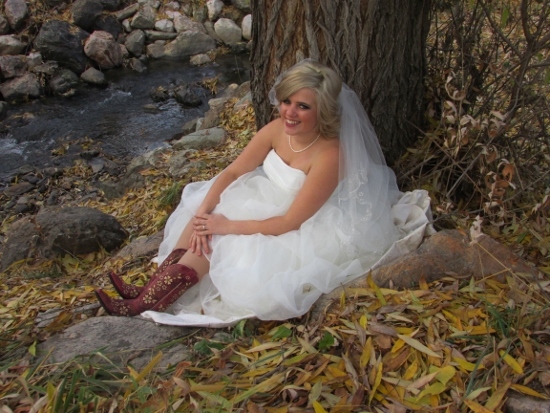 Her dress had been designed to show her cowgirl boots. 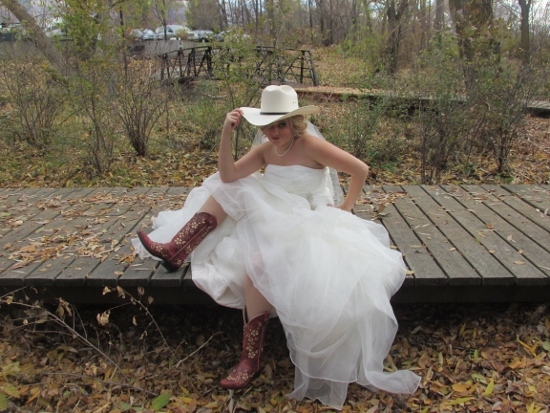 She had her husband-to-be’s cowboy hat to use as a prop in some of the photos. In this private, quiet, beautiful place just the two of us shared a very special time. We took our time and discussed ideas for poses and background locations. We had as much time as we wanted to, to set up the photos and each pose. We were able to view each photo on the digital camera and decide if it looked the way we wanted it to and if not, we could take it again, as many times as we wanted to. We laughed and smiled and remembered and dreamed. The session have didn’t have to end when a professional photographer said it was over. It didn’t end until we had decided we had all the beautiful photos we wanted, and the serious, and the joyful and the playful photos we wanted. 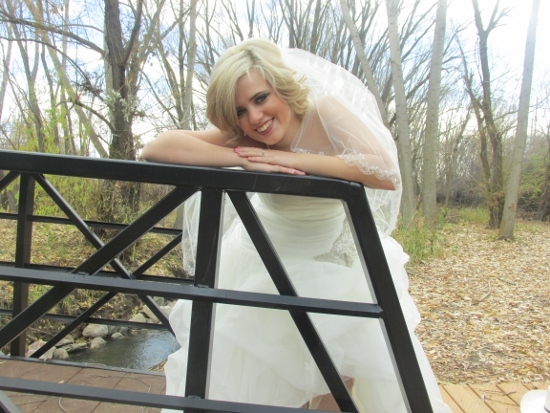 I think Tara’s bridal photos turned out beautifully, undoubtedly because of the gorgeous young woman who was their subject, and in spite of the photographer’s lack of expertise. It was a day that I enjoyed very much and will always remember. I think that sometime that day, was the moment in my mind that my little girl became a woman. How awful about your photographer! I recently got engaged and we have yet to book all of this stuff, but it really worries me! You did a fabulous job though, gorgeous photos and the scenery is just perfect! It was so unprofessional of the original photographer to leave you hanging like that, but you know what? I think you had the better experience. What a memory for you two to share and the bonding of making it work together! Brava!! Thank you Elizabeth. We had so much fun! 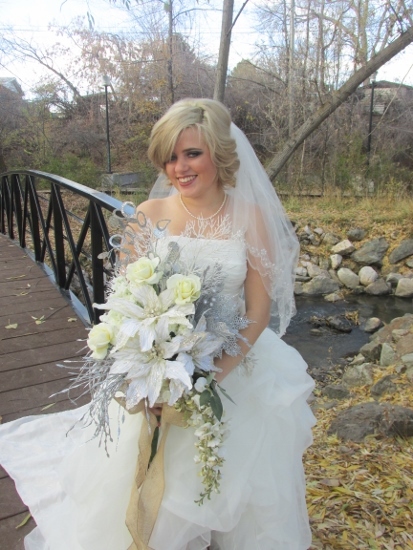 I think the photos came out beautifully and it sounds like you two had a great experience. That photographer was a jerk though. I would have been SO mad at them. That’s a rotten thing to do to a prospective bride. I remember how stressful my wedding was and my son’s wedding had all kinds of things going wrong. That is one day when you don’t need any added drama. Thank you Adrian! We did have a great experience. It was pretty stressful experience, but we came through it pretty good. 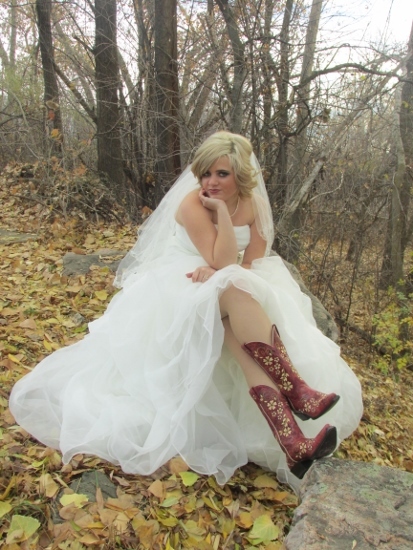 Beautiful photos and love the boots! Thanks Bernadyn! My daughter is very creative and has great style! These look great! You did a wonderful job for last minute. I would have been panicking for sure! That is really sad the photographer didn’t come through. These turned out so great though that you didn’t even need it! Ahhh so very special. So glad you were there for her though so that her pre-photos could be taken. And you could be out as long as you wanted taking the right photos and making memories! They turned out beautiful and looks professional! Thanks for sharing with us a the Home Matters linky party. We hope you join us again! Thank you Zan! I’ll definately be stopping by the Home Matters linky party again!